Growing tomatoes upside down is all the rage. The Topsy Turvy Upside Down Tomato Planter is advertised everywhere, with promises of bigger, better, and earlier tomato harvests, all while avoiding “the backbreaking work,” of growing tomatoes right side up. Here are some of the important highs and lows of growing tomatoes upside down. Good For Limited Space: For some people with limited space, hanging a tomato upside down is the only way to grow tomatoes. Some sunny balconies or decks are perfect for growing tomatoes upside down. No Staking Necessary: Most tomatoes, when grown traditionally, need staking. Stakes are used to keep tomatoes off the ground and to keep the stems from breaking from the weight of tomatoes. Apparently, some people hate staking tomatoes; if you are one of those people, growing tomatoes upside down may be a good solution. Foils Some Pests: When you grow tomatoes upside down, you don’t have to worry about cutworms or ground fungus. These are problems you don’t have to worry about with any tomato grown in a container garden. Hard to Hang: Upside down tomato planters can weigh more than 50 pounds when they are filled with damp soil and a large tomato plant. This makes hanging them a challenge. If you are going to hang one from a wall or ceiling, make sure all of your hardware is strong enough to hold all the weight. Also, an upside down tomato plant can move in a stiff breeze, so when you are hanging one, make sure you take that into consideration. Tomatoes Like Growing Up: When your upside down tomato plant starts to grow, it will try to grow up instead of down. It makes a “U” shape and bumps against the planter and looks kind of contorted and unsightly when growing this way. Hard to Find Sun: It is critical for tomato health to have full sun exposure - at least 6 to 8 hours a day. With the planter hanging over the tomato, this can be a problem because, when the plant is young, the planter can block the sun and shade the tomato. Challenging to Plant: To plant an upside-down tomato, you need to poke the tomato into a smallish hole and then add the soil. After your container is planted, you have to pick the whole heavy thing up and hang it. Limited Tomato Varieties: Not every variety of tomato will thrive growing upside down. Cherry tomatoes and other small-fruited tomatoes are recommended for growing upside down. There are many different types of planters and systems for growing upside down tomatoes. Some are fairly high tech and expensive and some are pretty simple. 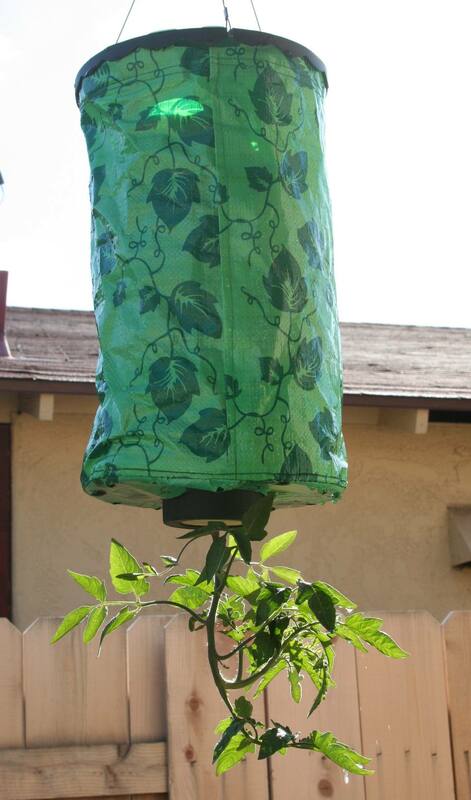 You can also make your own upside down tomato planter cheaply and easily using a big bucket. There are three basic ways to hang an upside down tomato planter. You can hang it from a wall, a ceiling or from a pole or hanging system. Unfortunately, most shepherd’s hooks that you can buy at nurseries or hardware stores, will not hold the weight of the upside down tomato planters. Gardeners Supply carries a heavy-duty wall bracket that is both attractive and designed to hold up to 50 pounds. The bracket does not come with screws, so you have to make sure you get some that are tough enough for your heavy planter. Also, make sure that whatever you are attaching the hook to will take the weight. You can also buy heavy duty, attractive hangers from hardware stores. Gardeners Supply also carries a "Four-Arm Plant Hanger." This looks like a great product, though it is pricey and you do need to use all four hooks to balance the hanger. So should you grow tomatoes in upside down planters? I think the answer is only yes if you can’t grow tomatoes right side up, for reasons of space or sunlight. Otherwise, I think it is easier to grow them right side up.